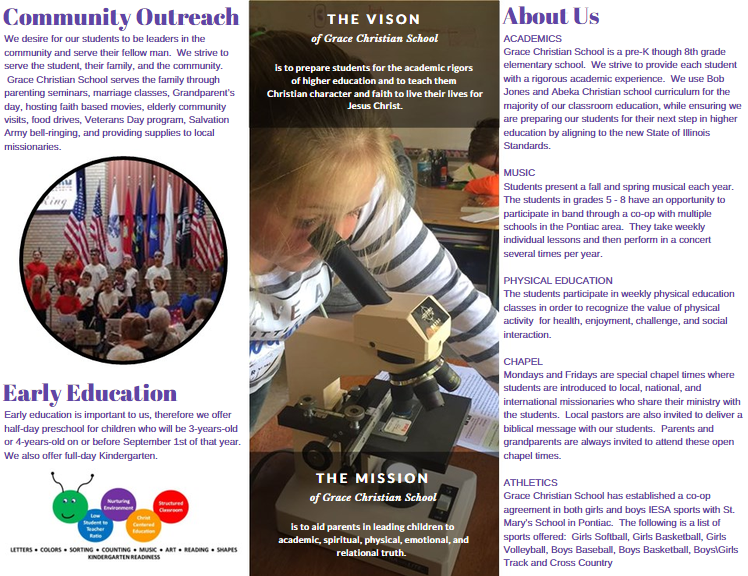 GCS is an elementary school serving grades Pre-K through 8th grade. Have you heard of the Invest in Kids Act and the private school scholarships that result? In August 2017, the Illinois Legislature passed Senate Bill 1947, which allows both corporations and individuals in Illinois to direct their state income tax liability by making a charitable donation to a state-certified scholarship organization. If you fit into a category that qualifies for scholarship eligibility (chart is listed below), we encourage you to fill out an application because the program is based on first-come, first-serve. The application is easy to complete and should take you less than 10 minutes. Also, during this application, there is no income verification!! The choice you make for your children's education shapes them academically, spiritually, and in their worldview. At Grace Christian School, we are equipped to address each of these developing areas of your child's life. And we take this responsibility seriously! Consider the GCS advantage. Find out more information by accessing our brochure. REGISTRATION INFORMATION: Registration information for the 2018-2019 school year is available on our website or hard copies of the registration packet can be picked-up in the main office. SCHOOL SUPPLY LIST for 2018-2019: The school supply list was posted to the School Supply Page on our website. Students can bring their school supplies to the Parent/Student Orientation. NEW FAMILIES: Any family that is interested in visiting the school is welcome to do so by calling the school office at (815) 419-2030 to schedule an appointment. Registration information is available on our website or available to pick-up from the school office. PRESCHOOL: We will be enrolling preschool students for the Fall 2019 for children who will be at least 3 years old by September 1st, 2019. Registration information will be posted to the website soon. Call Kelly Fogarty at (815) 848-1680 for more information. MOMS-IN-PRAYER: Moms in Prayer will meet on the 2nd & 4th Wednesdays of the month in the west room at GCS at 8:15am. Please join other mothers as they come together and pray for the students, teachers, families of GCS, our community, and God‘s direction and protection over the school. Don't forget to save your LABELS FOR EDUCATION and BOX TOPS for GCS. Please encourage your family and friends to also save them for us. These labels and box tops allow us to get valuable playground equipment that we would otherwise have to pay for. March 4 - 8 - Celebrate Dr. Suess Week! ​Invest in the next generation! 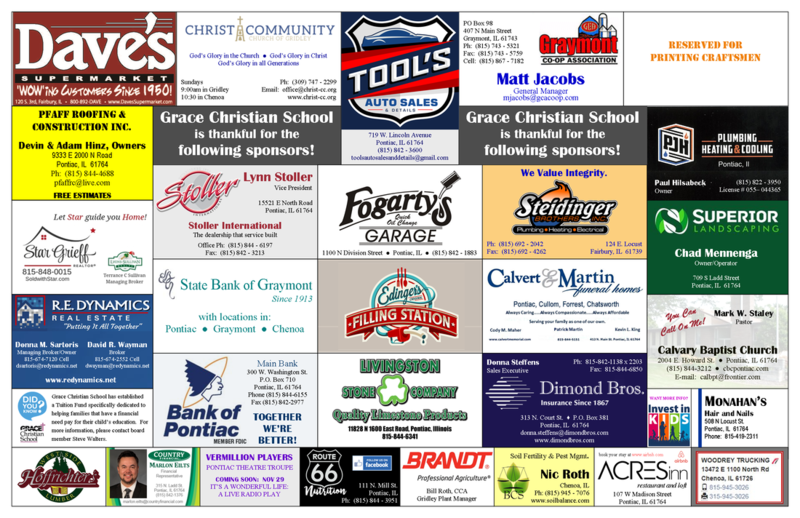 Thank you to the following churches and business for your support! 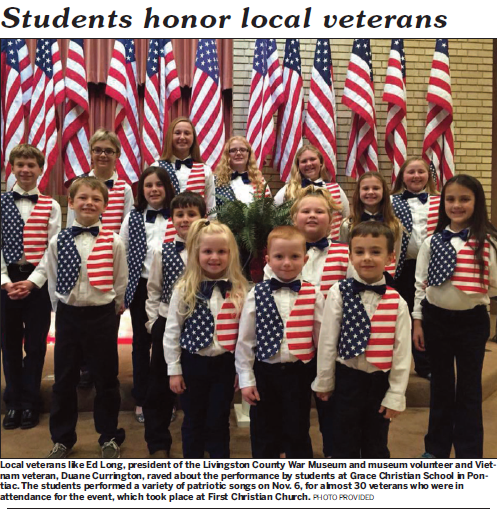 We were very honored to be mentioned in our local newspaper by veterans like Ed Long and Duane Currington. This picture and caption appeared in The Daily Leader on November 11th. Happy Veterans Day to all men and women who serve in the armed forces! Click on the Community Forum, Financial Peace University picture above to hear Pastor Bartholomew talk about the 9-week program we are hosting with Pontiac Bible Church starting on September 13th. Sign-up today! More information is list under News and Information. Grace Christian School and Pontiac Bible Church are partnering together to host Dave Ramsey's Financial Peace University 9-week program. More information is listed under News and Information. The parenting seminar we hosted is over but you can click the picture above to listen to a short podcast on the WJEZ Community Forum. Click the picture to view the 2014 Grandparents Day video.